We’re thrilled to celebrate A Chorus Line with A Chorus Line – 40th Anniversary Celebration, the definitive, newly remastered edition of the best-selling 1975 Original Broadway Cast Recording. 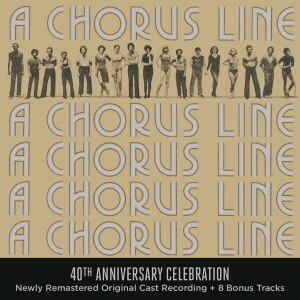 The reissue features eight bonus tracks that – for the first time – allow the listener to eavesdrop on the creative process of composer Marvin Hamlisch and lyricist Edward Kleban, including songs that did not make it into the final version of their acclaimed score.A Chorus Line – 40th Anniversary Celebration will be available October 23, 2015 on CD, downloads in enhanced audio formats and streaming service providers. Included in the package for the 40th Anniversary Celebration is an expanded booklet with new liner notes by Oskar Eustis (Artistic Director of The Public Theater in New York), Terre Blair Hamlisch, Linda Kline (co-bookwriter of A Class Act) and Robert Viagas (Managing Editor, Playbill.com). Simultaneous to the 40th Anniversary Celebration release is a newly remixed and remastered gatefold vinyl LP edition of the cast album. Cut from high-resolution files by Kevin Gray at Cohearent Audio and manufactured on 180-gram vinyl at Memphis Record Pressing, the set includes a digital download card redeemable for the entire 40th Anniversary Celebration set.